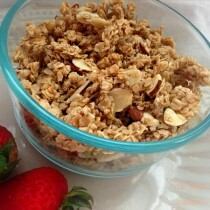 An easy, delicious recipe to make your very own granola. Eat it as a snack, or add it to fruit and yogurt for a quick, simple breakfast. In a medium bowl, combine oats, cinnamon and salt. In a smaller bowl, whisk together coconut oil, honey, vanilla and almond extracts. Pour liquid over oat mixture and stir together until well coated. Spread out thinly on a cookie sheet lined with parchment paper. Bake at 300 for 20-25 minutes. Allow to cool completely before removing from sheet.